celebrating Les Voiles de Saint-Tropez from 10 a.m. to 10 p.m! We are delighted to see ou there! 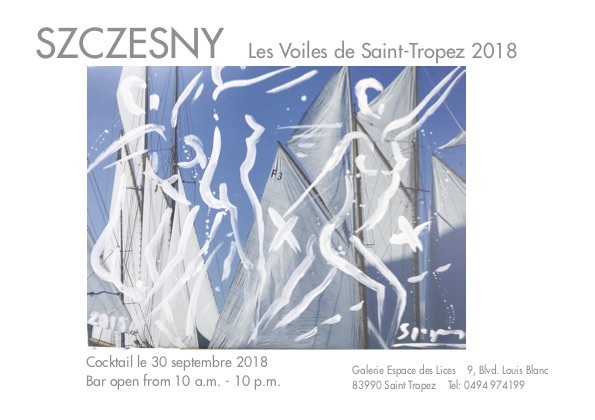 The Atelier Szczesny and Althoff Villa Belrose are delighted to invite you to a cocktail at the Citadelle of Saint-Tropez. We are happy to invite you to our exhibition "Petits formats". On show is a selection of small formats. We are delighted to announce you the upcoming Szczesny exhibition at Althoff Grandhotel Schloßhotel Bensberg organised by Kellermann Gallery, Dusseldorf. We are pleased to inform you about the Szczesny exhibition at Gerald Hartinger Gallery in Vienna, Austria. Please save the date. We keep you informed. We are delighted to invite you to a group display at Agnes Sandahl Gallery, Ramatuelle. Coming up! Cocktail June 9th, 6pm! 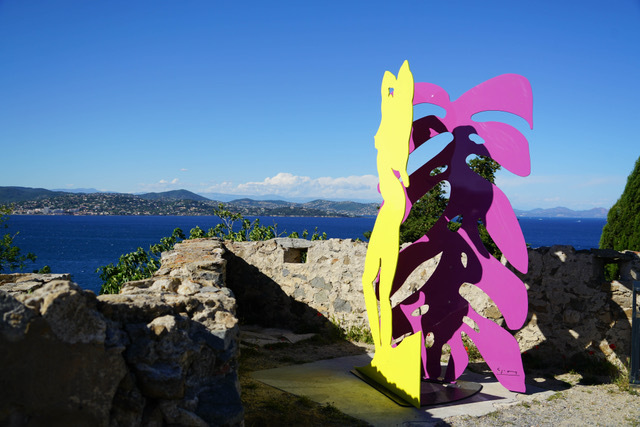 We would like to inform you about our up- coming exhibition of monumental sculptures at the Citadelle de Saint-Tropez. The art show will take place from June 10th until the end of November. In May, some of the sculptures will be taken by helicopter to exceptional positions right above the Golfe de Saint-Tropez. by a catalogue, will contain new coloured sculptures, Shadows sculptures and the golden sculptures as well as the “Arbre de Vie” and ceramic works. 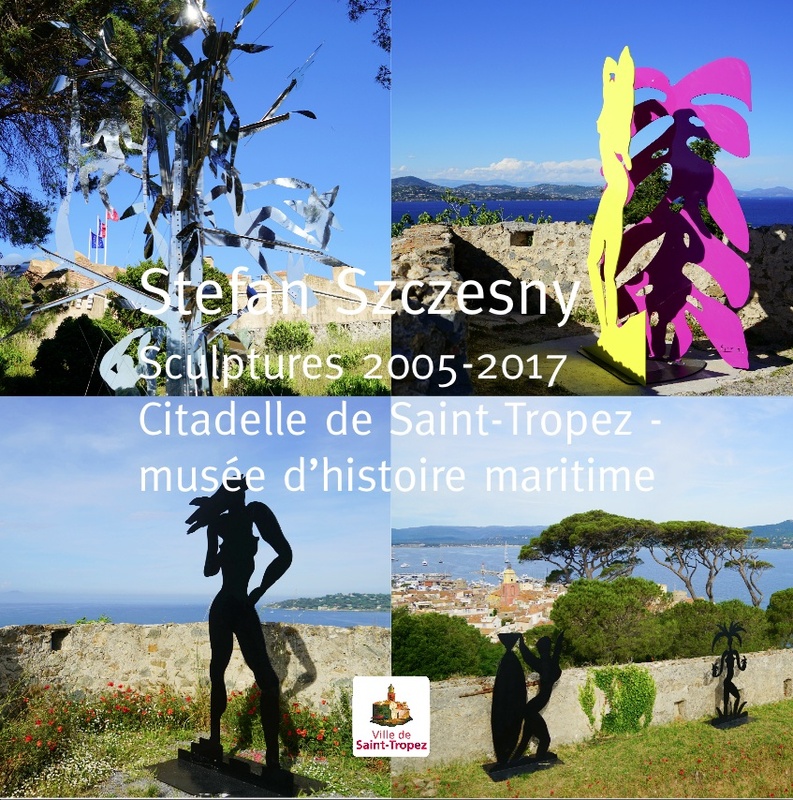 The cataloug features the Szczesny exhibition "Szczesny Sculptures 2005-2017" at the "musée d'histoire maritime" at the citadelle of Saint-Tropez. The introctuction texts of Jean-Pierre Tuveri (mayor of Saint-Tropez), Serge Astezan and Frédéric Ballester (director of the museum Malmaison, Cannes) inculded. 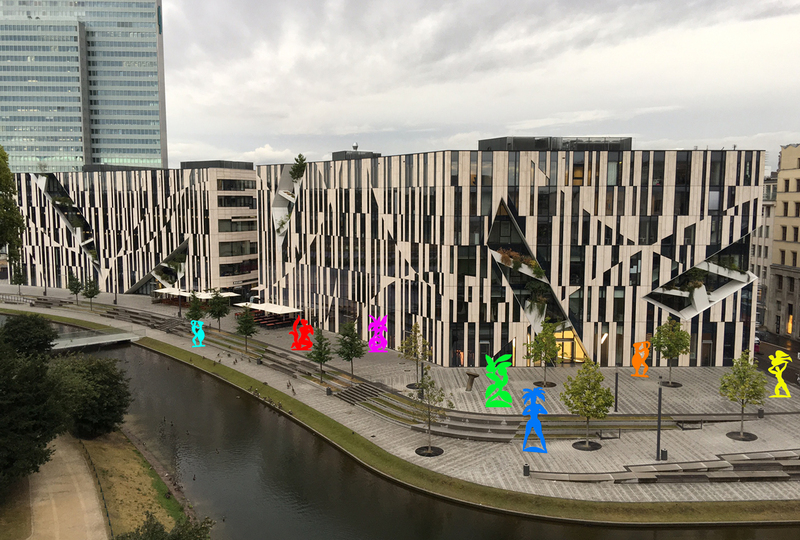 Parallel to the start of this year's Tour de France 2017 in Düsseldorf, Stefan Szczesny shows monumental,colourful sculpturesat the famous Kö-Bogen and paintings at the Steigenberger Hotel. 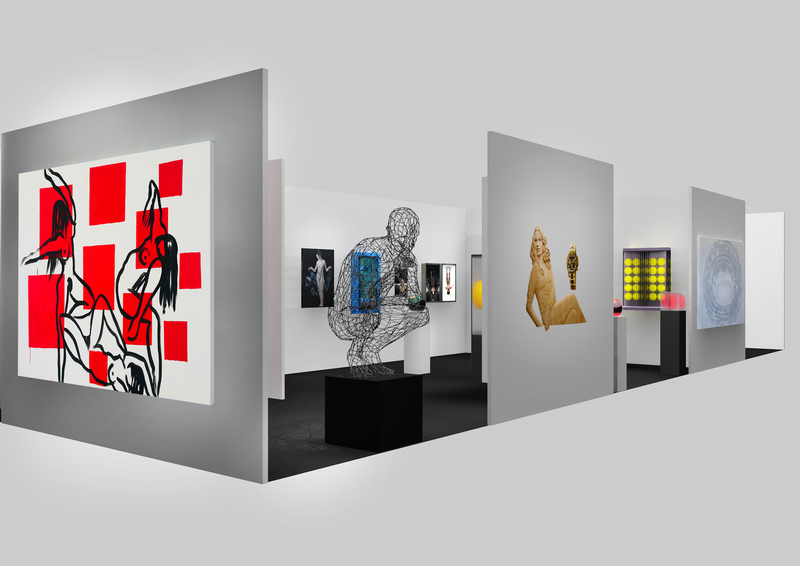 The exhibition and the whole event "Tour de l'Art" is organised by Kellermann Gallery, Dusseldorf. In the run-up of the Opening of the exhibitipn "Szczesny at Schmelzwerk", we are delighted to invite you to a press conference at Schmelzwerk (Sarotti Höfe), Berlin. You are invited to see the preview of the exhibition and to degust Markus Herbicht's Flying Food Collection 2017. Saint-Tropez Tourisme will be represented by the director of Saint-Tropez Tourisme Claude Maniscalco. 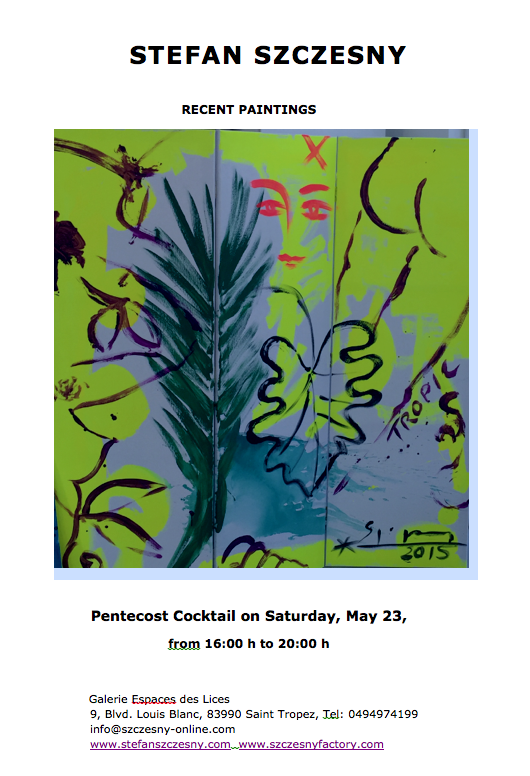 We are delihted to invite you to our easter cocktail at Galerie Espace des Lices,9, Bd Louis Blanc, Saint-Tropez. 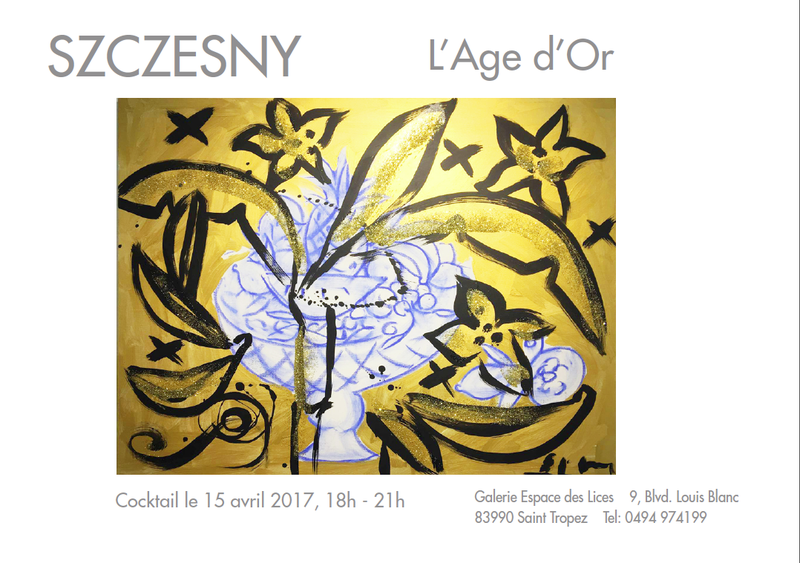 Opening of the exhibition "Szczesny L'Âge d'or "
We are pleased to announce our next upcoming event. Szczesny at Schmelzwerk (Sarotti Höfe), Berlin. Sponsored by Saint-Tropez Tourisme. You are more than invited to see Stefan Szczesny's new paintings at the Schmelzwerk and to degust Markus Herbicht's Flying Food Collection 2017. Saint-Tropez Tourisme will be represented by Claude Maniscalco. 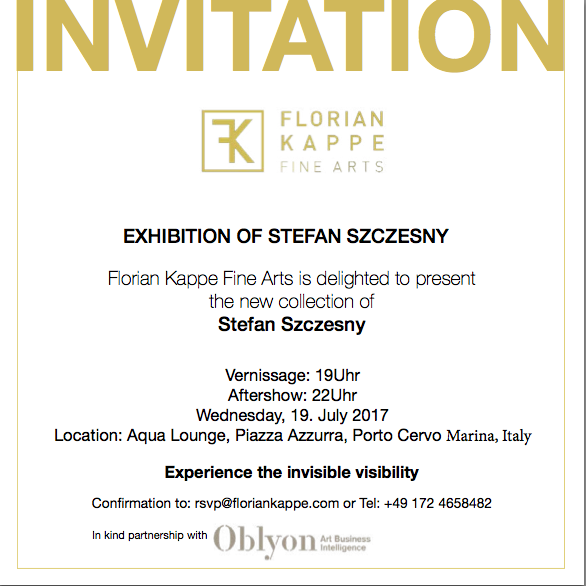 We are deligthed to anounce that Stefan Szczesny will be at the Art Karlsruhe with a "one man show" represented by Kellermann Gallery, Düsseldorf. The current exhibition in the Galerie Espace des Lices, 9 BV Louis-Blanc, shows a new serie of golden paintings. 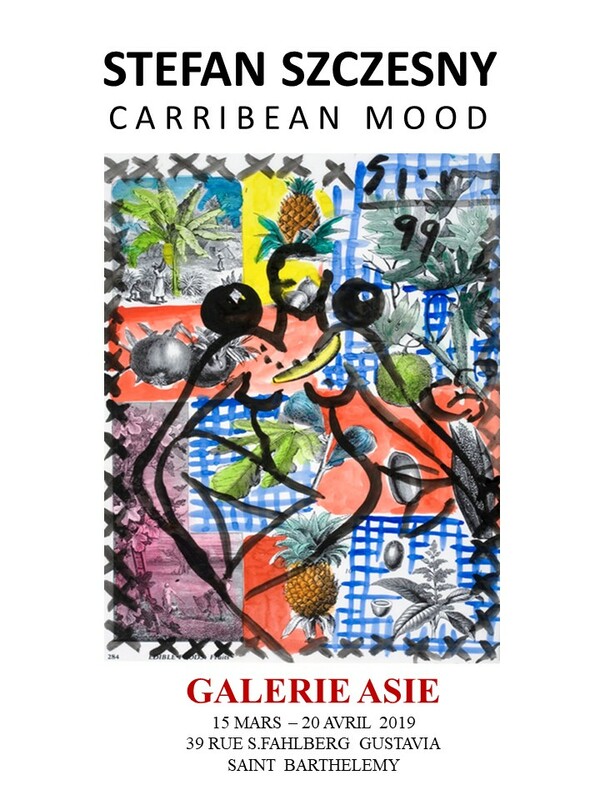 We are pleased to announce a Szczesny exhibition at Galerie Mönch, Bremen. Opening: 17th September 2016, 8pm & 18th September 5pm. We are pleased to announce an upcoming exhibition of various Szczesny works at Galerie Kellermann, Düsseldorf. The exhibition will start with a cocktail on 4th September 2016 at 11am. 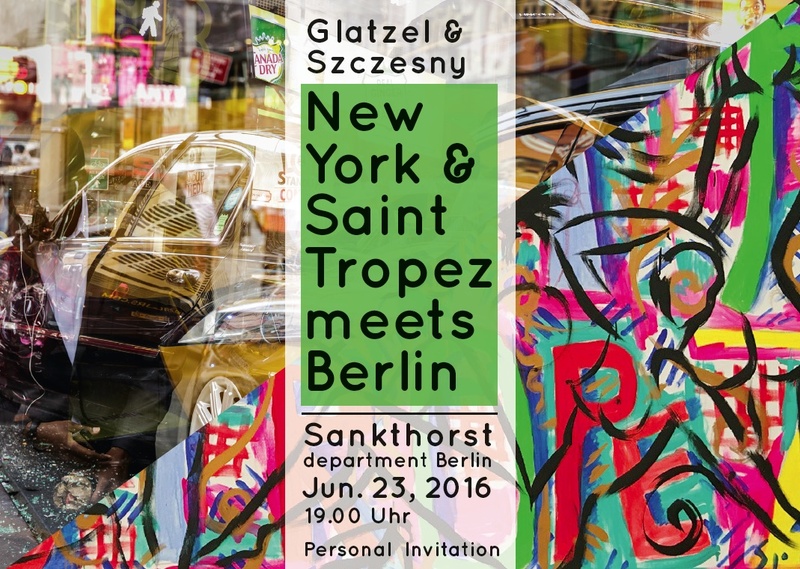 We are delighted to announce the exhibition "New York & Saint-Tropez meets Berlin", a joint project of Georg Glatzel and Stefan Szczesny in the rooms of the former Emil Nolde museum in Berlin. On display are photographs and paintings originated in New York and Saint-Tropez. The exhibition "New York & Saint-Tropez meets Berlin" illustrates the vivid relation between these extraordinary, vibrant places. 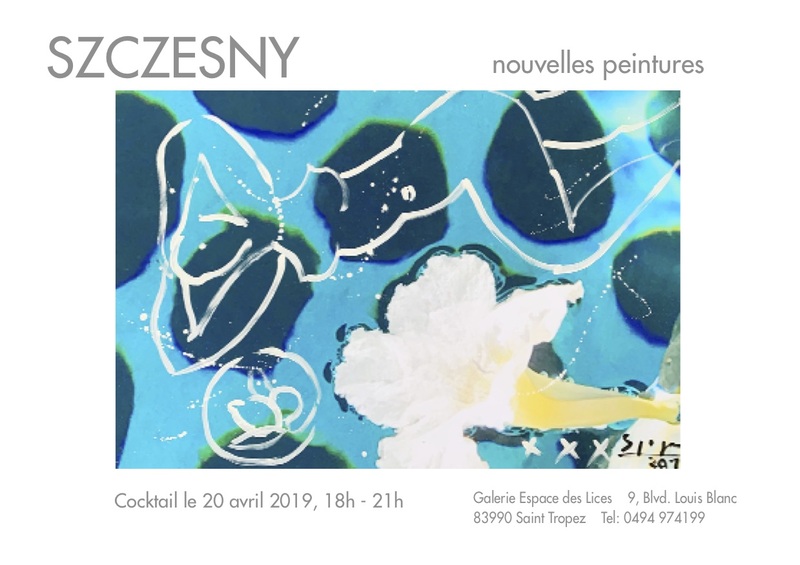 Opening: 23rd June, 7 p.m.
We are delighted to announce the Szczesny exhibition at the Golf-Club of Saint-Tropez. 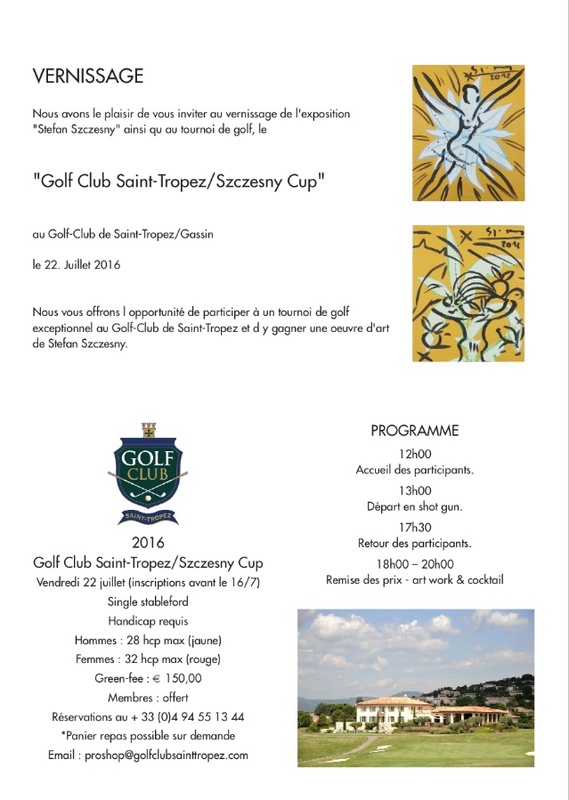 Please register for participation until 15th July at the Golf-Club of Saint-Tropez at +33 (0)4 94 55 13 44 or with us at +33 (0)49 97 41 99 (or by replying to this email). 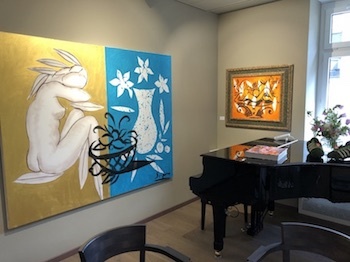 A fine selection of recent works is currently on display in Stefan Szczesny's showroom in Saint-Tropez. We are pleased to announce a comprehensive exhibition of Szczesny's work at redbox gallery, Zurich. Aptly entitled "Welcome to Saint-Tropez", the exhibition shows a large selection of paintings inspired by the famous hotspot on the Côte d'Azur, the artist's adopted hometown of Saint-Tropez. The exhibition opens with a cocktail on March 16, 2016. We are delighted to announce the opening of a year-long exhibition of shadow sculptures ("Szczesny sculpture park") at the Golf Club of Saint-Tropez/Gassin. In addition, numerous paintings on canvas will be on display (all throughout 2016) in the club house. Picturebook "Szczesny. Best of Saint-Tropez"
We are pleased to announce the publication of a new picturebook. The latest of a series of Szczesny picturebooks in a handy 12 x 12 cm format, “Best of Saint-Tropez” gives a personal insight into Stefan Szczesny’s beloved hometown on the Côte d’Azur and shows the artist’s latest artistic developments. For more information, please contact info@szczesny-online.com. We are delighted to inform you about our next exhibition, taking place at Galerie Schimming in Hamburg. The exhibition opens with a cocktail on 10th November, 2015, at 8.30pm. On display until 14th Januar, 2016. 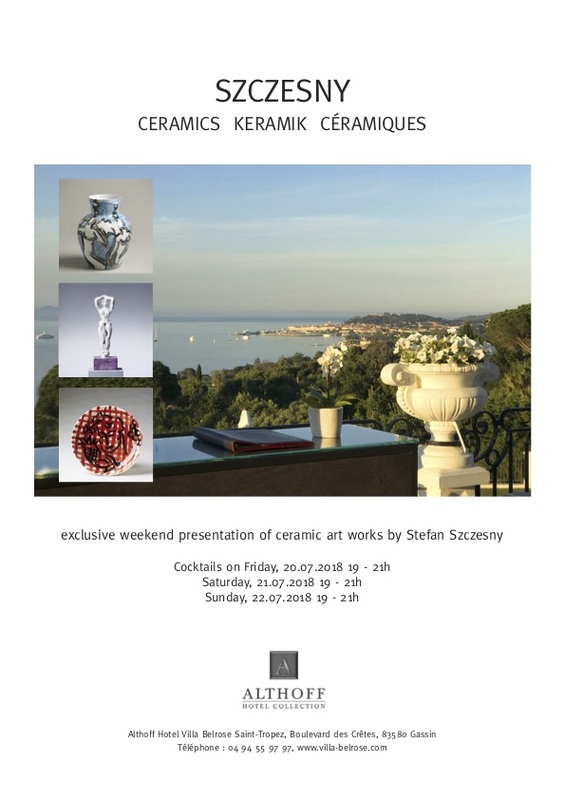 We are pleased to announce an exhibition of ceramics and sculptures at Vila Domergue in Cannes. The central piece of the exhibition will be Szczesny's "Tree of Life", a 6.5m stainless steel sculpture originally produced for the Szczesny exhibition at the Palais des Papes in Avignon (the sculpture has kindly been lent by its current owner, the Cosmo Art & Science Foundation). We invite you to Mr. Szczesny’s book-signing session, tomorrow, 1st August at the “Librairie de Saint Tropez”, 22 Rue Quaranta, Saint Tropez. Stefan Szczesny will be present from 10 am to 1pm. It will be a wonderful occasion to talk to the artist and to get in contact with other artlovers in a charming ambiance. This is also a unique opportunity to get a signed copy of the “Szczesny Monographie”. Book-signing Special Offer: only 100 € (instead of 148€). 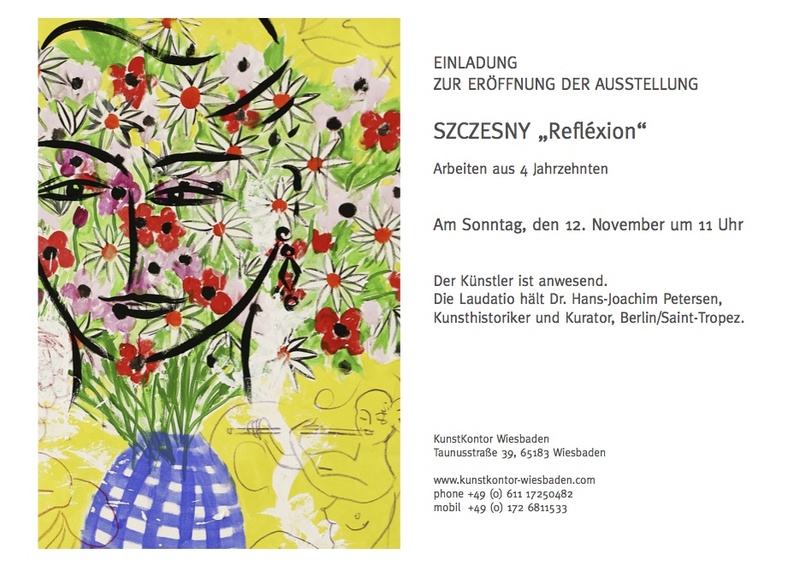 We proudly announce our exhibition, simply called "Szczesny" at the Gallery Kronsbein in Munich, Germany. The Szczesny artwork will be shown at the Gallery Kronsbein from the 9 th of July on. You are more than welcome to dicover a crosscut through the work of Mr. Szczesny. We are happy to announce our next exhibition at the Galerie Noah in Augsburg, entitled 'Im Licht des Südens' ('Southern light'). 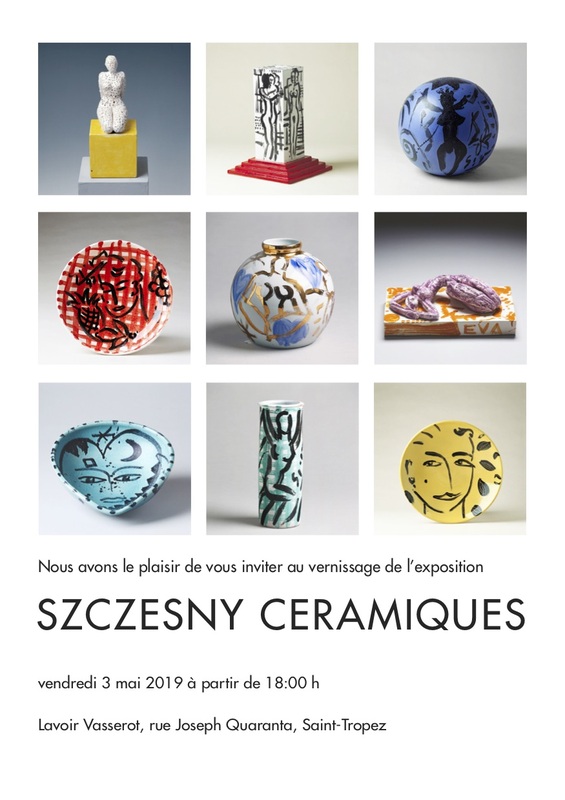 The Szczesny exhibition "Shadow sculptures" at the Domaine de la Croix, La Croix-Valmer will be shown until the end of summer. The exhibitions opens with a cocktail on 18th July 2016 at 6pm. Cocktail reception at Jigsaw store, London, April 30TH, 6pm to 8pm. 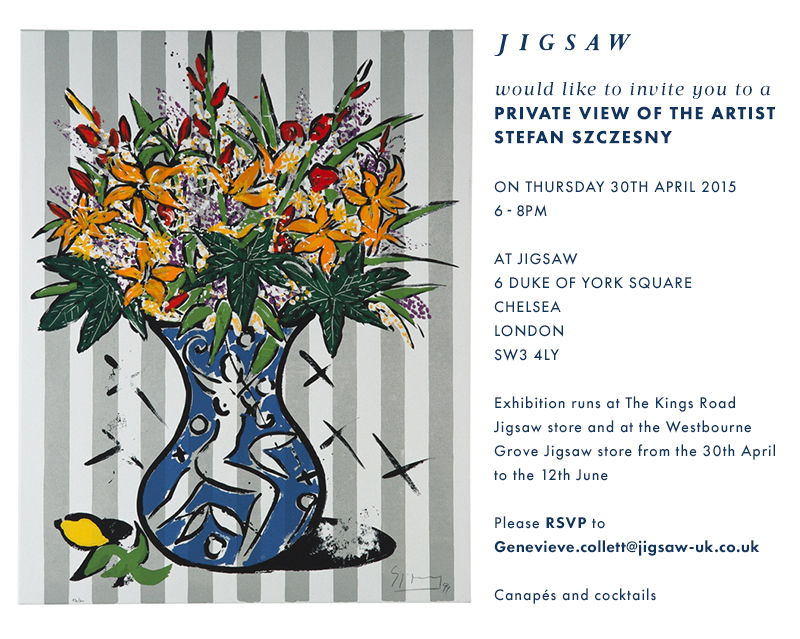 We are delighted to invite you to a vernissage at Jigsaw shop in London (6 Duke of York square, Chelsea, London SW3 4LY) on April 30TH, starting at 6pm. On the occasion of Art Basel Miami Beach, CU1 Gallery in downtown Miami presents Szczesny's (now trademark) shadow sculptures as well as a prime selection of his paintings on photography. The exhibition will be on display all throughout the art week, from December 1 through 7. CU1 Gallery boasts one of the finest exhibition spaces in Miami and is conveniently located in downtown Miami, south of the Wynwood Art District. During the art week, the gallery will be open from 10am through 7pm. The artist will be present all week. Special appointments can be made upon request. The exhibition catalogue can be viewed online here. We are delighted to announce the exhibition "Szczesny: Métamorphoses méditerranéennes" to be held at the Palais des Papes in Avignon in 2014. The exhibition will present a comprehensive overview of Szczesny's oeuvre. The exhibition will open on June 6, 2014. We are delighted to announce the opening of Markus Herbicht's "Schmelzwerk/Sarotti Höfe" in Berlin on 27th March at 6.30 pm. The event location has been outfitted with custom-made paintings on photography by Stefan Szczesny. Stefan Szczesny and Markus Herbicht have been close friends for many years. This is their first professional collaboration. We are delighted to invite you to the presentation of the monograph "Szczesny. Méditerranée, L'esprit du sud" at Galerie Guy Pieters on Friday, December 20, at 6pm. The artist and the editor of the book, Frédéric Ballester (director of the Centre d'art La Malmaison, Cannes) will be present. On the occasion a selection of masterpieces shown in the book will be on display. The exhibition will continue until December 27, 2013. On the occasion of the Miami art week (Art Basel Miami Beach and satellite fairs), Florian Haffa and Addison House Aventura present the exhibition "Szczesny: Saint-Tropez meets Miami". The exhibition features paintings on photography and sculptures. Exhibition dates: December 3-8, 2013. Preview on December 2 at 6pm. Cocktails with the artist each day of the exhibition at 6pm. Exhibition venue: Addison House Aventura, 2850 Northeast 187th Street, Aventura, FL 33180. We would like to draw your attention to the Placet Charity Art Auction to be held at Hotel de Rome, Berlin, on Sunday, October 20. The auction will include a painting by Stefan Szczesny. We are delighted to announce the official opening of a Szczesny sculpture park at Schlosshotel Molkenkur on September 19, 2013, beginning at 6pm. On the occasion of the exhibition a selection of other Szczesny artwork will be on display. The artist will be present. We are delighted to announce the extension of the exhibition "Blühende Welten: Stefan Szczesny & Fürstin Antonia" at Sigmaringen Castle. The exhibition will now continue until spring 2014, albeit with a slight change: the seven large-formatted golden paintings (part of a series conceived as a hommage to Lucas Cranach) will be exchanged for another series, also focusing on the exhibition's nature theme. Seven of Szczesny's shadow sculptures have been installed at Sapporobogen, Munich, near the Olympic Stadium. To celebrate the installation, a vernissage will be held, on site, on July 11, 2013, at 7pm. The artist will be present. Catalogue "Szczesny. Acht Goldene Bilder"
In early 2013, Stefan Szczesny created a series of eight golden paintings which were conceived as an hommage to Lucas Cranach and of which seven are currently on display in the exhibition "Blühende Welten" at Sigmaringen Castle. "Acht Goldene Bilder" presents the series. A free online version is available here. We are delighted to announce the upcoming exhibition entitled "Blühende Welten. Stefan Szczesny & Fürstin Antonia" at Sigmaringen Castle. The exhibition will largely concentrate on Szczesny's use of nature imagery. 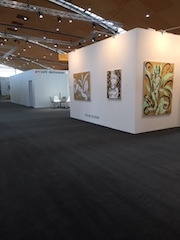 Exhbition items include large-formatted golden paintings, paintings on etchings, golden sculptures and shadow sculptures. The exhibition will open on May 11, 2013. Vernissage on May 24, 3-7pm. We are pleased to announce a comprehensive, and permanent, exhibition at Hotel Adlon Kempinski in Berlin. 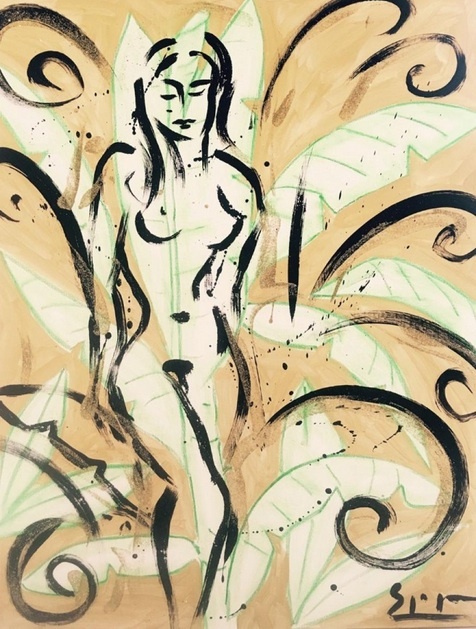 The exhibition implies the presentation of a large number of paintings, ceramics and sculptures in two of the hotel's restaurants (the "Quarré" and the "SRA BUA by Tim Raue") as well as in certain public areas. The paintings in the "SRA BUA" were painted on site. The exhibition is the result of an exclusive collaboration between the artist and the hotel. We are delighted to invite you to a vernissage in our showrooms in Saint-Tropez (7 Bd. Louis Blanc) on March 30, starting at 6pm. Please join us for a vernissage in the beautiful gardens of Beddington Fine Art on Easter Monday, April 1. We are pleased to announce a comprehensive exhibition of shadow sculptures and paintings at the Kempinski Hotel Bahía in Estepona, Spain, opening on March 27, 2013. The hotel was designed, by Szczesny and the architect, as total work of art in the late 90s. It may be considered a "Szczesny art hotel". The exhibition complements the artworks permanently installed at the hotel. 23 shadow sculptures are set up in the gardens of the hotel; in addition, a large number of paintings, dating mostly from Szczesny's Seville period (2001-2002) but also including recent 2012 works, are on display. Exhibition dates: March 27 to end of June 2013. The Novotel Monaco currently presents an exhibition of golden sculptures and paintings. It explores Szczesny's use of gold to celebrate the beauty of life. For further information and images of the exhibition, please click here. Exhibition open until February 22, 2013. We are delighted to announce the exhibition: "Szczesny: Neue Wilden works from the 80s" at 532 Gallery Thomas Jaeckel in New York. The exhibition is curated by Donald Kuspit, one of the United States' most distinguised art critics and formerly A. D. White Professor at Large at Cornell University. It explores the early 80s, when Szczesny emerged as one of the protagonists of a young generation of bold figurative painters in the German-speaking world who came to be known as "Neue Wilde." The exhibition presents an outstanding selection of works on canvas, works on paper and ceramics. September 13 to October 8, 2012. "Szczesny: Neue Wilden works from the 80s"
Exhibition catalogue published on the occasion of the exhibition: "Szczesny: Neue Wilden works from the 80s" at 532 Gallery Thomas Jaeckel in New York, curated by the distinguished art critic Donald Kuspit. Includes an essay by Donald Kuspit and a documents-section shedding light on the "Neue Wilde" in the early 80s. We're pleased to announce a major exhibition of Stefan Szczesny's artworks in Frankfurt. Around 70 sculptures are on display in various important locations. 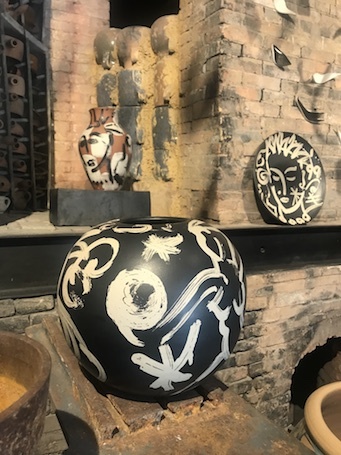 In addition, paintings and ceramics are exhibited. The centre of the exhibition is Frankfurt's Palmengarten. Exhibition Dates: 28th June to 26th August 2012. The sculptures are on display until mid-October. Locations: Palmengarten Frankfurt, Frankfurt trade fair, the "Squaire" at Frankfurt Airport, Rothschildpark, "Nizza", Hotel Roomers, Hotel Steigenberger Frankfurter Hof, Hotel Hessischer Hof. 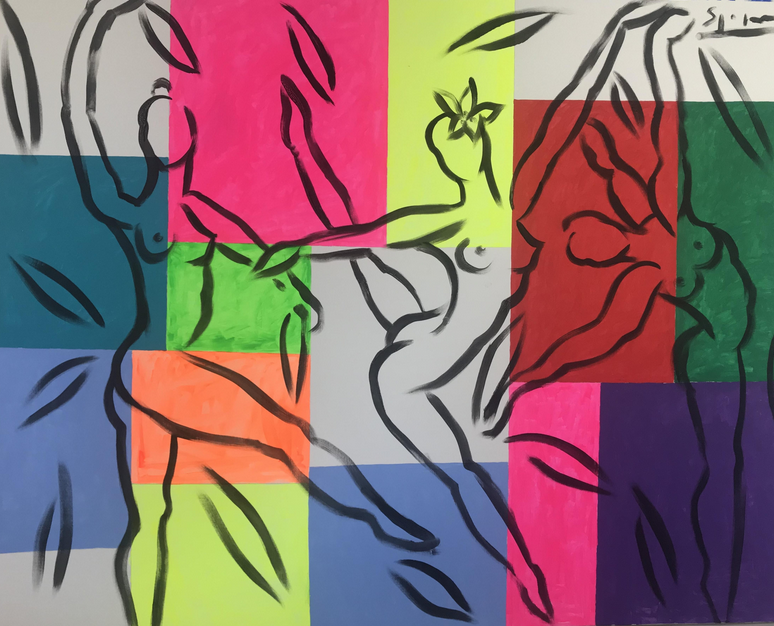 On the occasion, the gallery "Frankfurter Kunstkabinett Hanna Bekker vom Rath" will host a Szczesny exhibition entitled "nature" (27th June to 26th August). Art Journal "Szczesny in Frankfurt"
Art Journal published on the occasion of the exhibition of Stefan Szczesny in Frankfurt.With photos by the renowned photographer Horst Hamann. December to mid-April, Grandhotel Schloss Bensberg / Schlosshotel Lerbach. We invite you to join us for a private view on Sunday, 5th February 2012, 11am, at Schloss Bensberg. We invite you to join us for a private view on Sunday, 23rd February 2012, 7pm, in Hotel Adlon’s “Restaurant Quarré”. 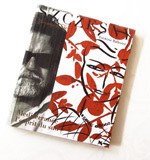 Release of the new Szczesny Monography with a text by Frédéric Ballester and photos by Udo P. Klein.